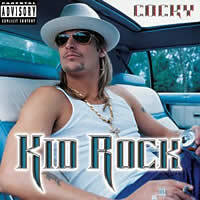 Detroit heavy metal rapper, Kid Rock was born Robert James Ritchie, in Romeo, Michigan. Robert James Ritchie, AKA, Kid Rock, has won many music awards for his unique style of music which combines Hip-Hop, Southern Rock and Country. His past works include albums entitled: "The History of Rock", "Rebel Without a Cause", "The Polyfuze Method" and many more.